The Internet has brought great conveniences in our modern lives, especially in the field of shopping and research. Buying any item, even brand new or used cars, has been made easier and transactions faster. 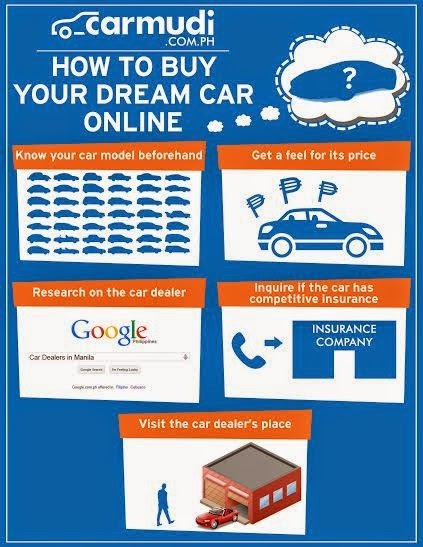 So, how do you buy your dream car online, without falling prey to common mispractices of opportunistic car dealers? Below is a complete guide from vehicle marketplace Carmudi Philippines. Car shoppers often have narrowed down the car models that they want to own. Either they have been saving for that particular car model or an immediate need, such as the family got bigger, presented itself. So whether you are aiming to buy a Ford Mustang or a Hyundai Starex, the first thing to do is to research on the compatibility of the car to your needs or personality. Several car review websites and magazines like C! Magazine, have insightful and throrough car reviews, where you get to have a preview of the car’s performance and the standout features it has. Prices of brand new cars are often set by car manufacturers and varies only depending on its variant or trim level. When shopping for used cars online, you must at least look for at least a dozen listing to get a general pricing pattern for the model. Several factors that make the price of second hand cars depreciate are its general condition, year built, mileage, and equipment (i.e. DVD headrest). Sometimes you have to look for multiple listings just to make sure that you get the best deal out there. But, one of the convenience of shopping a car online is that you can choose the best bargain without physically moving from one dealer lot to another. Chances are car buyers before you have made a transaction to the car dealer or seller who owns the car you want to buy. One of the unique features of Carmudi PH is its rating system, where car buyers could give a rating to the dealer, they have transacted based on their availability, competency, service and the information they provide about the car. When dealing with a private seller, the online car portal recommended that buyers arrange meetups and giving the money physically rather than through money transfer services. Often, most scammers price their car’s low, and then asks for a down payment through wire transfer, before running away with your money. After you have gone through these first few processes, the next thing to do is to check if the dealer has the necessary documents, such as LTO registration, and more importantly a competitive insurance, especially if it is a used or second hand car. Ask for details as much as possible and know what type of insurance it has- comprehensive, third-party or act only liability. The last step in the process of buying your car online is to visit the car dealer’s lot. When buying used cars, never be shy to ask the dealer for you to personally inspect the car beginning with the exterior- looking for dents and scratches; moving to the hood- checking for the engine fluid levels; into the interior- ensuring the instrument panel and equipments are working; and test driving the car to have a feel of its handling and engine noise. Lastly, if you are satisfied have all the papers signed, get your keys and drive your dream car to its new garage. Carmudi Philippines is a comprehensive online car portal that displays the listings of brand new and used cars, motorcycles and commercial vehicles from trusted vehicle dealers across the country. The website also has a journal page, which contains useful tips and resources covering the automotive industry.